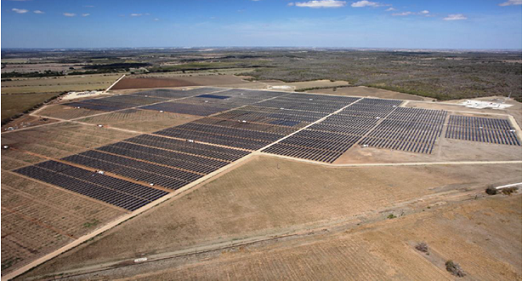 Austin City Council approves negotiation with SunEdison for 150 MWs of West Texas Sunshine! Yesterday, the Austin City Council approved a resolution to direct Austin Energy to negotiate a deal to procure up to 150 MWs of solar power from West Texas through a Power Purchase Agreement with SunEdison. Austin Energy will return next week to City Council with a more detailed contract for final approval. Under the limited information that has been released publicly and discussed at City Council yesterday, Austin Energy GM Larry Weis explained that the deal was a take and pay contract where Austin Energy is only obligated to pay for any electricity generated by the plant at a fixed rate of roughly $50 per MWh or 5 cents per KWh. That is well below the retail rate paid for by Austin Energy consumers and is often below the wholesale market rate of energy in Texas, especially during hot summer days when solar produces the most electricity. While recent press articles suggest that some California utilities are pursuing even cheaper PPAs, the announced price of $45 to $55 per MWh would represent the lowest price in the US that we could find thus far and is a game-changer in the energy industry. As an example, Austin Energy’s deal with the Webberville solar PV plant costs roughly $165 per MWh, and was only built four years ago. While AE was originally only looking for 50 MW of solar capacity in this latest request, they took a larger position because the price is so much cheaper than expected. Weis said on Thursday that while more solar was available at similar prices, his recommendation for the moment was not to go beyond the 150 MWs of additional solar to be built by 2016 until Austin Energy does a fuller review of all its energy needs, future costs and scenarios. Previously City Council has asked Austin Energy to consider doubling their solar goal from 200 to 400 MWs by 2020, as recommended by the Local Solar Advisory Council, a position supported by the Sierra Club. Austin Energy has said wait until we update our generation plan. Ok I’ve written about this before but the pace is getting to be mind-boggling. Every month, ERCOT releases its Monthly Status System Planning Report and the amount of proposed generation keeps growing. And in particular what appears to be winning is wind power, and increasingly solar. The February 2014 Monthly Status Report shows that ERCOT is currently tracking 219 proposed projects totaling over 55,300 MWs, about half – 26,700 MWs in all — of which is wind. The latest to sign what is known as a Generation Interconnection Agreement with the local transmission company is the Briscoe Wind Farm, a 300 MW facility located in West Texas. Just earlier this month we announced that Austin Energy had negotiated a cheap wind deal with Lincoln Renewable for 300 MWs in Castro County. Here are the latest numbers from ERCOT. What is pretty interesting is the geographic distribution of these projects. If you look at ERCOT’s five traditional load zones — Panhandle, West Texas, North Zone, South Zone and Coastal Zone, future natural gas projects dominate in the South and North Zone — where wind and solar resources are just not as strong. But from the Coastal Zone — where gas and wind split the pie — to West Texas and especially the Panhandle, wind and increasingly solar beat out gas projects. Coal you might ask? Two projects – a tiny 30 MW proposed project in Milam County and the long-awaited IGCC project by Summit in Ector County, which has been delayed three times, and is currently scheduled for 2018.. maybe. Petroleum Coke, like those proposed Las Brisas and White Stallion projects that SIerra Club fought? Dead. none. What about nuclear? Didn’t NRG and Luminant promise to build us new reactors? Dead. In fact, other than gas, wind and solar, the only projects are three proposed storage facilities which could revolutionize the use of renewable energy, making it dispatchable just like gas. Webberville Project — three times more expensive than the new one they are talking about. Now back to Austin Energy. While two weeks ago we told you about a deal to purchase wind at a bargain rate of $26 to $36 per MWh that City Council recently approved — a price rivaling what we pay for our dirty coal power — this Thursday Austin Energy will be proposing to City Council that they authorize negotiations over two utility-scale solar plants to be constructed by SunEdison. While the exact price can not be revealed, Austin Energy is reporting that it is between $45 and $55 per MWh, making it the cheapest solar deal in the country. The two plants will total up to 150 MWs of capacity, and be located in West Texas. If these deals come to fruition, Austin Energy would not only meet its 35% renewable energy commitment four years early by the time the plants come online in 2016, but even its 200 MW solar goal. With the Local Solar Advisory Committee recommending that Austin Energy double its goal to 400 MWs by 2020, Austin Energy’s initial negative reaction — based on a belief that solar would cost more in the $80 to $100 per MWh range — now seems well.. so last year. In fact, Austin Energy reports that they had over 125 proposals for utility-scale solar from 66 separate projects, and $100 per MWh was the very highest they got. In fact, most were in the $60 dollar range. Remember in 2009, we negotiated a deal for 30 MWs of solar for around $165 per MWh. So that means for Austin Energy solar energy prices got chopped by some 70% between 2010 and 2016 when the latest solar projects get built. Yesterday, the Alamo city dealt a serious blow to Austin’s somewhat greenish reputation. 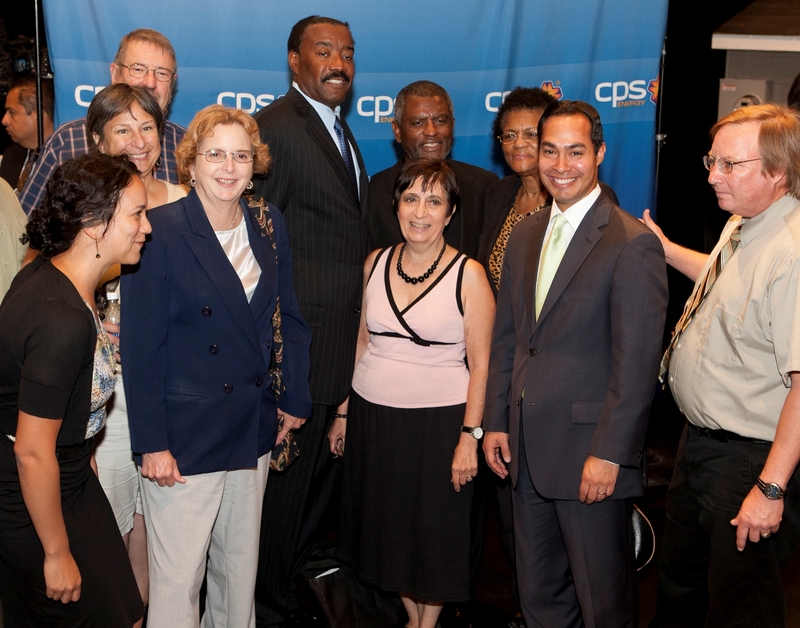 San Antonio Mayor Julian Castro announced that City Public Service’s (CPS) Deely coal-fired power plant will shut down by 2018, and solar power contracts for the San Antonio area will replace the dirty energy and bring clean energy jobs. CPS Energy has committed to meeting 20% of its energy needs through renewable energy by 2020, and reducing its peak demand through energy efficiency by 780 megawatts. CPS Energy recently began receiving power from a 14 MW solar plant in South San Antonio, and has signed a contract with SunEdison for an additional 30 MWs of solar power. This is the first coal plant retirement in a state that leads the nation in greenhouse gas emissions. This is the first coal plant retirement in a state that dedicates almost half (47.8%) of all of its water withdrawal goes to thermoelectric plants. To quote Biden, this is a big… deal. You know. Meanwhile, the city of Austin continues to get its power from the Fayette coal plant in Fayette county, notwithstanding the fact that the plant has caused $200-300 million in health injury costs just in 2005 (According to the National Research Council’s 2009 Report, “The Hidden Costs of Energy”) and destroyed the livelihood of local pecan farmers. Go local, indeed. The city of Austin is taking its sweet time on the Austin Energy Resource Generation and Climate Protection Plan, which was developed to “make Austin Energy the leading utility in the nation for greenhouse gas reductions” and meet certain clean energy goals, including 30% renewable energy by 2020 and at least 700 megawatts of energy efficiency measures. 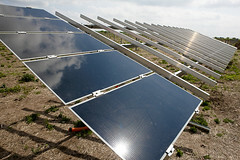 The plan requires three studies with an expected completion date in 2012, including 1) exploring the possibility for phasing out the Fayette coal plant by 2020 2) increasing the energy efficiency goal from 800 megawatts to a possible 1000 megawatts 3) setting an onsite renewable goal for Austin (distributed solar). There are six months left in the year 2011. The expected completion date for these studies is in 2012. The city is focused on the rate case this fall, where the costs of installing half a billion dollar pollution control equipment on the Fayette coal plant (scrubbers) will no doubt be passed on to ratepayers. Apparently, we have to pay the coal plant not to contaminate our seafood with mercury. Concerned? The Austin Sierra Club group meets every second Tuesday of the month at Scholtz’s garden at 6pm. Monday afternoon, San Antonio Mayor Julian Castro is expected to announce that City Public Service’s (CPS) Deely coal-fired power plant will shut down by 2018. Additional solar power contracts for the San Antonio area will replace that dirty electricity and bring clean energy jobs to Texas. In advance of today’s expected announcement, the Sierra Club, SEED Coalition, and Public Citizen issued the following statement. The announcements today confirm the new direction taken by CPS Energy which has committed to meeting 20% of its energy needs through renewable energy by 2020, and reducing its peak demand through energy efficiency by 780 megawatts. CPS Energy recently began receiving power from a 14 MW solar plant in South San Antonio, and has signed a contract with SunEdison for an additional 30 MWs of solar power. Charles English and the Jefferson Heights Association of neighbors living near the coal plant, Cindy Wheeler and the activists of Energia Mia, Karen Hadden with the SEED Coalition (Sustainable Energy for Economic Development), and Tom ‘Smitty’ Smith with Public Citizen also played instrumental roles with Van Coppenolle and the Alamo Sierra Club, Reed, and Neil Carman, . Environmental groups do not support the west Texas Summit coal plant that could be part of San Antonio’s plan. The CPS Deely plant is the first publically-owned coal plant slated for retirement in Texas. Sierra Club has called for phasing out the Lower Colorado River Authority’s Fayette coal plant, which is partially-owned by the City of Austin. The Sierra Club’s Beyond Coal Campaign has also called for the phase-out of several privately owned coal plants: TXU-Luminant’s Big Brown coal plant in Fairfield, the Martin Lake coal plant near Henderson , and the Monticello coal plant near Mount Pleasant. Several recently permitted coal plants in Texas have been prevented from starting, and three, White Stallion, Las Brisas, and Tenaska face additional obstacles. Attendees at the Texas Renewable Energy Industries Association annual meeting in San Antonio this week got a double dose of good news. First, in a ribbon cutting ceremony with CPS Energy and local politicians, Colorado-based Juwi Solar opened up the 14 MW thin-film utility-scale “Blue Wing” solar plant just south of San Antonio. Secondly, Chairman Barry Smitherman with the Public Utility Commission announced in response to a question that the PUC still intended to publish a rule to finally implement the target to obtain 500 megawatts of renewable energy from sources other than wind by 2015. Indeed a note on the PUC website has confirmed that a proposal to publish a rule will be considered at the December 16th PUC meeting. 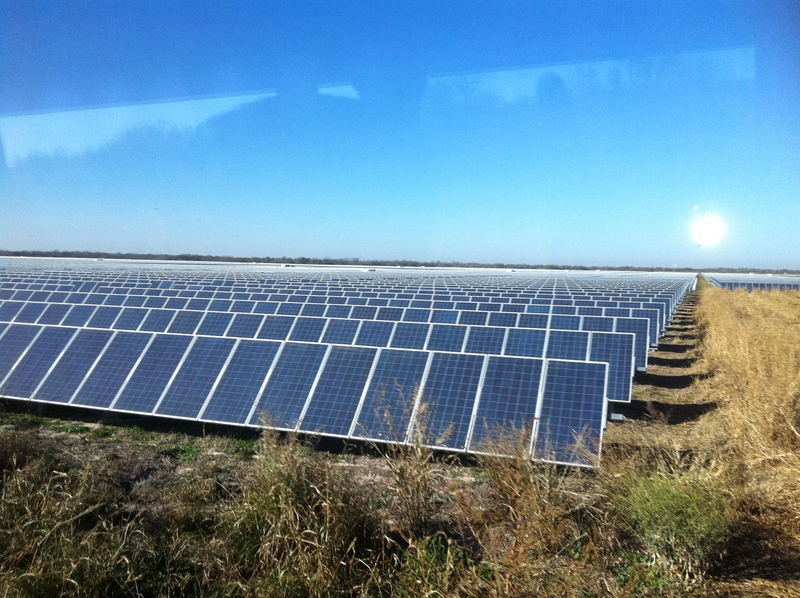 CPS Energy contracted the Blue Wing Solar plant back in June of 2009 to Juwi, which after construction and months of testing, threw the switch on providing enough electricity to power 1900 homes in San Antonio through 4290 thin-film solar arrays, each with 50 solar modules over 112 acres of farmland. That’s 215,000 photovoltaic panels in all. In addition, the solar farm includes 500 kilowatts of demonstration technologies — a concentrated solar array, various thin-film technologies as well as more traditional PV crystalline solar modules. CPS Energy and Juwi will thus have a live laboratory of other solar technologies to assess over the coming years. The San Antonio plant is only one of six utility-scale plants being planned for construction in Texas. 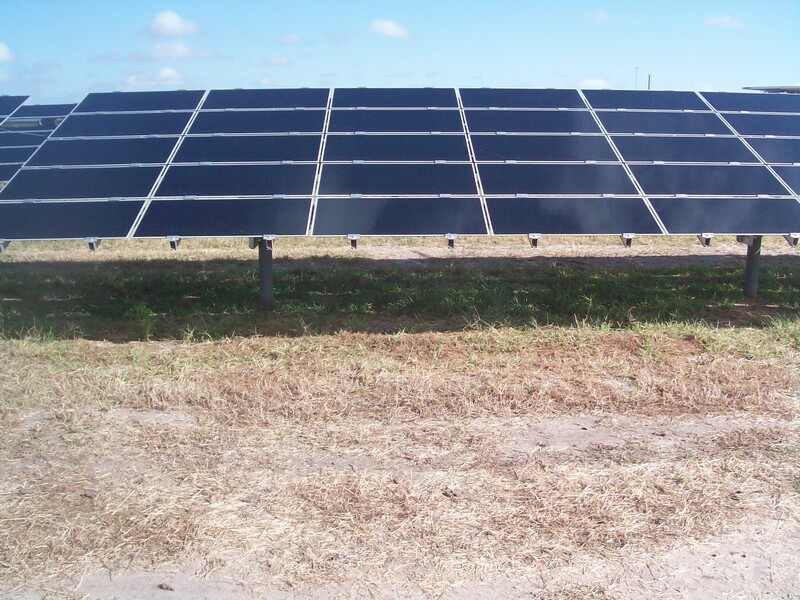 Thus, CPS Energy is also contracted with SunEdison for 30 MWs of solar in the San Antonio area, while Austin Energy is contracted with a private company to build 30 MWs of solar east of Austin in Webberville. A new company, RRE Austin Solar has plans to build two 60 MW solar PV plants in Pflugerville and Big Spring. All of these plants are being built without an active market for solar renewable energy credits through Texas’s Renewable Portfolio Standard largely because they involve public entities — like CPS Energy, Austin Energy and the Pflugerville ISD — that want to invest in solar energy to meet their own goals. To really spur the solar market, implementing the Legislature’s law that Texas should have at least 500 MWs of solar, and other non-wind technologies by 2105 is a must. During the TREIA conference, Smitherman said that as long as he could get one of his fellow commissioners — Commissioner Anderson — to propose a reasonable rule, he would support publishing it for further comment in December. That being said, actually turning the proposal into the rule in Texas will either take the PUC actually adopting it before June of 2011, or the Texas Legislature passing any additional renewable goals during the 2011 Legislative Session. Stay tuned for more on this issue.